Over at The Leaf Press Gifts a new design has been added to the range of wedding related gifts. 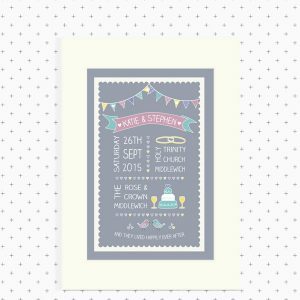 The first is an all new design with a patterned background which is personalised with details of the wedding. This includes the happy couple’s names, the wedding date and time and the venue(s). The design is available in a choice of any two colours for a personal look. The second personalised wedding picture also depicts details of the wedding day. 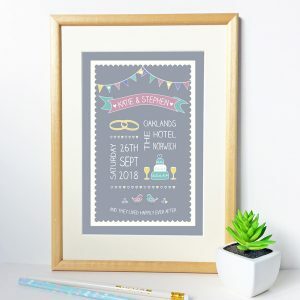 It has a contemporary grey background with bunting and images of birds, the wedding rings, the wedding cake and glasses. 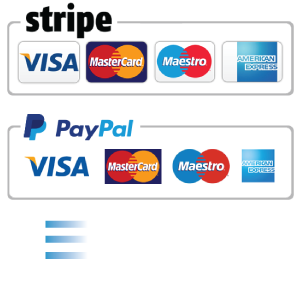 Both pictures are A4 size and supplied with a mount and backing board and in a cellophane bag. They can be given as a gift as they are or placed in any standard A4 frame. Please this link to visit the Engagements and Weddings section of The Leaf Press Gifts – be sure to check out the personalised wedding notebooks too!